This is a list of some of the regions in the United States. Many regions are defined in law or regulations by the federal government; others by shared culture and history; and others by economic factors. U.S. Census Bureau Regions and Divisions. The United States Census Bureau defines four statistical regions, with nine divisions. The Census Bureau region definition is "widely used [...] for data collection and analysis," and is the most commonly used classification system. Puerto Rico and other US territories are not part of any census region or census division. The ten standard federal regions were established by OMB (Office of Management and Budget) Circular A-105, "Standard Federal Regions," in April, 1974, and required for all executive agencies. In recent years, some agencies have tailored their field structures to meet program needs and facilitate interaction with local, state, and regional counterparts. However, the OMB must still approve any departures. The Federal Reserve Act of 1913 divided the country into twelve districts with a central Federal Reserve Bank in each district. These twelve Federal Reserve Banks together form a major part of the Federal Reserve System, the central banking system of the United States. Missouri is the only U.S. state to have two Federal Reserve locations within its borders, as some states are divided into more than one district. U.S. Courts of Appeals circuits. 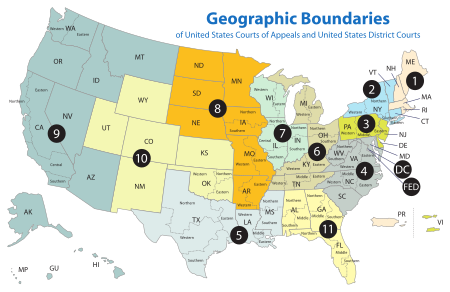 The Federal Circuit is not a regional circuit. Its jurisdiction is nationwide, but based on subject matter. Bureau of Economic Analysis regions. The Bureau of Economic Analysis defines regions for comparison of economic data. The Energy Information Administration currently uses the PADD system established by Petroleum Administration for War in World War II. It is used for data collection on refining petroleum and its products. Each PADD is subdivided into refining districts. East Coast: Maine, New Hampshire, Vermont, Massachusetts, Rhode Island, Connecticut, New Jersey, Delaware, Maryland, Virginia, North Carolina, South Carolina, Georgia, Florida; along with counties in New York east of, north of and including Cayuga, Tompkins, and Chemung; and counties in Pennsylvania east of and including Bradford, Sullivan, Columbia, Montour, Northumberland, Dauphin and York. Appalachian No. 1: West Virginia along with counties of Pennsylvania and New York State not mentioned above. Texas Inland: Texan counties not mentioned above. Louisiana Gulf Coast: Parishes of Louisiana south of, and including Vernon, Rapides, Avoyelles, Pointe Coupee, West Feliciana, East Feliciana, Saint Helena, Tangipahoa and Washington; along with Pearl River, Stone, George, Hancock, Harrison, and Jackson County of Mississippi; and Alabama's Mobile and Baldwin County. North Louisiana-Arkansas: Arkansas and parts of Louisiana, Mississippi and Alabama not mentioned above. For a more comprehensive list, see List of belt regions of the United States. A map of Alabama regions. 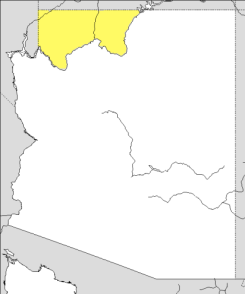 For a more comprehensive list, see List of regions of Arizona. For a more comprehensive list, see List of regions of California. The Greater Bridgeport Region in location to other officially recognized Connecticut regions with regional governments. The Connecticut Panhandle and "The Oblong". In Connecticut, there are 14 official regions, each with a regional government that serves for the absence of county government in Connecticut. There are also a fair number of unofficial regions in Connecticut with no regional government. Southern Illinois is also known as "Little Egypt". 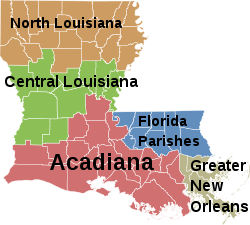 A map of Louisiana's regions. The Berkshire region of Massachusetts. 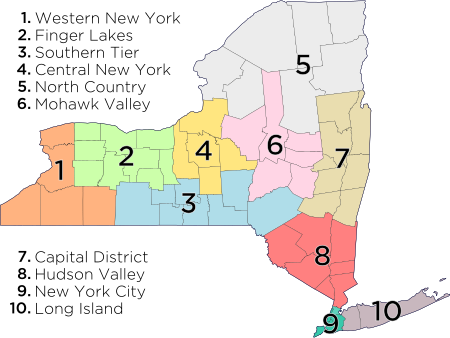 Regions of New York as defined by the New York State Department of Economic Development. A map of the Shenandoah Valley. 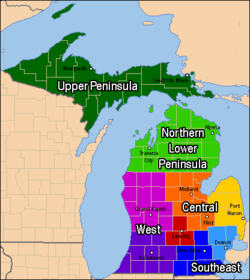 Wisconsin can be divided into five geographic regions. ^ United States Census Bureau, Geography Division. "Census Regions and Divisions of the United States" (PDF). Retrieved January 10, 2013. ^ "Census Bureau Regions and Divisions with State FIPS Codes" (PDF). US Census Bureau. Archived from the original (PDF) on September 21, 2013. Retrieved June 20, 2010. 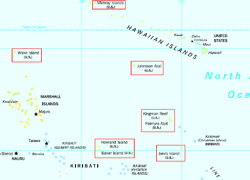 ^ "Geographic Terms and Concepts - Census Divisions and Census Regions". US Census Bureau. Retrieved August 19, 2015. ^ "BEA Regions". Bureau of Economic Analysis. February 18, 2004. Retrieved December 27, 2012. ^ "Records of Petroleum Administration for War". Retrieved January 3, 2012. 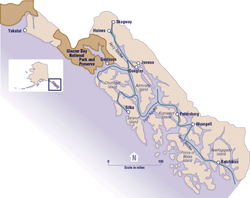 ^ "Appedix A: District Description and Maps" (PDF). Energy Information Administration. October 2012. Retrieved January 3, 2012. ^ "PADD Definitions". Energy Information Administration. Archived from the original on October 16, 2011. Retrieved January 3, 2012. This page was last edited on 1 April 2019, at 03:13 (UTC).